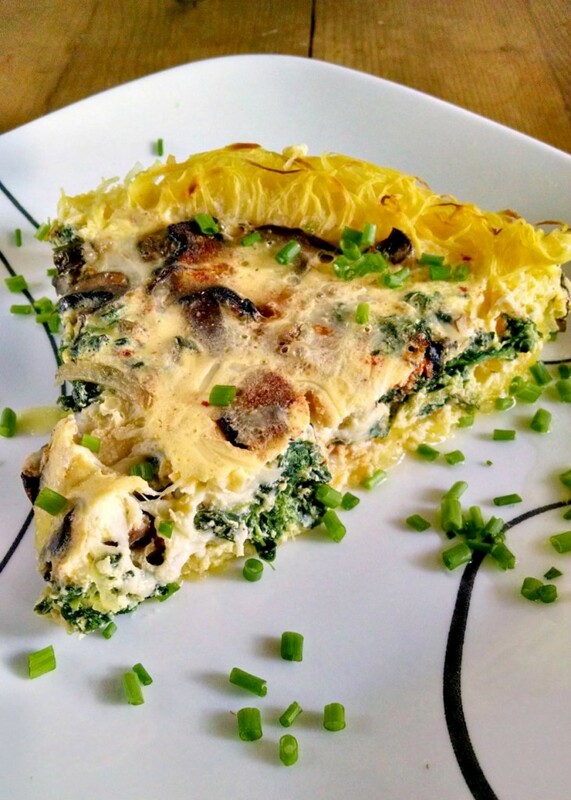 Using spaghetti squash as the crust makes a delicious and low-carb Spinach and Mushroom Quiche with Spaghetti Squash Crust. The texture and flavor of the squash enhances the spinach and mushroom flavors in this meal. Shh, Mom! I can hear you from here! Not the yellow kind. Heck, it took me decades to figure out if I peeled zucchini, I didn’t mind the flavor and eat it often. Spaghetti squash, butternut, acorn, patty pan; YUM! They’re all delicious to me now. I still don’t like yellow, BUT I love LOVE yellow zucchini. I’m sure you can find it often in my posts this summer. You can see the “crust” in this picture pretty well. It wasn’t the easiest thing to make a crust out of. I highly suggest using some water to keep your fingers from sticking to the squash. Being as it’s slightly under cooked, it’s a bit sticky. Don’t say I didn’t warn ya! But it honestly didn’t take that long and much effort to make the crust. The squash looks like hash browns in this picture. I bet you could easily substitute hash browns with the squash in this recipe. Don’t you think? The spaghetti squash looks just like hash browns in this photograph. I’ve wanted to do a Denver omelet style frittata type thing. I think that would be delicious! Ever since my Mom did a Denver omelet muffin type thing, I’ve wanted to recreate it on a larger scale. Can I just say, I LOVE my Le Crueset pie pan that I won? I honestly don’t even know HOW I won it, but it’s perfect for frittatas and tortillas, and PIES! Not that I bake a lot of pies but I honestly could with this wonderful pie plate. It’s much larger than my metal ones and holds so much more! 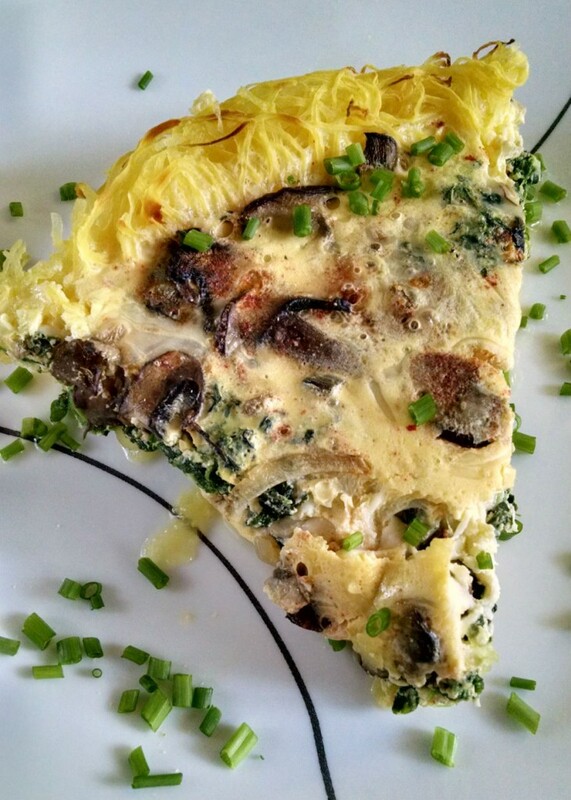 I love how the crust just becomes part of the quiche in this recipe. It’s not a container that holds the ingredients; it IS part of the quiche here. 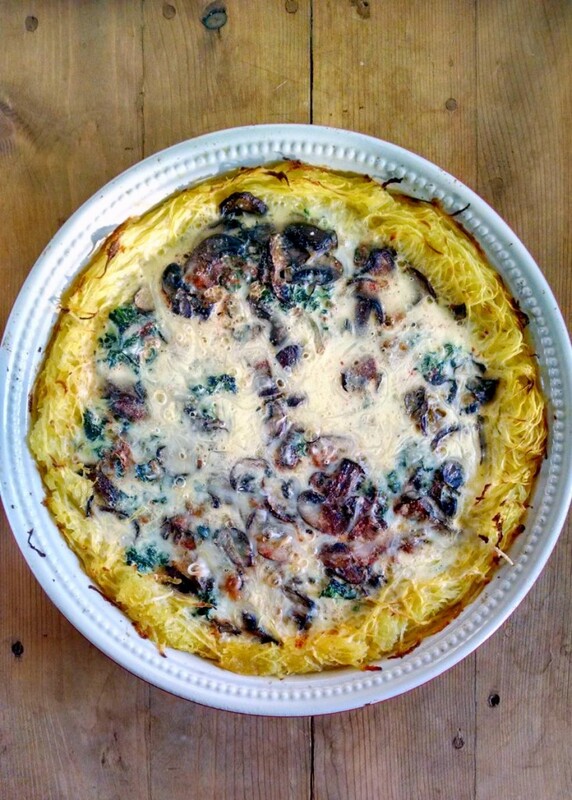 The spaghetti squash melds completely with the spinach, mushrooms, and egg in this case. You’ll wonder why you didn’t try this earlier. I did! And for those doing the low carb thing, this truly is delicious and perfect! I’m always looking for low carb recipes for Dad. I wound up making a low carb recipe for Dad! I SUCKED at cutting this. I was so hungry I didn’t really cut it pretty for the photographs and cut it kind of crooked. You’re saying, “You can’t tell,” but I know you can. *I* can. If I can, you can. Thank you for being nice about it, though. But I am a firm believe that it doesn’t have to look pretty to taste delicious. And oh my does this taste delicious! Honestly, it is so tasty! Just look at the mushroom, spinach, squash and egg goodness that is this quiche. The squash almost looks like phyllo threads as the crust, which I wouldn’t mind either. I love phyllo dough and could eat it plainly baked with just some salt and pepper or sugar, depending. I garnished with some green onions. They highlight the shallots that are in this recipe without killing the delicate flavor of the shallots. And the green onions make it look so pretty, doesn’t it? It’s a level of flavor and color that just finishes the dish perfectly! You can see how the crust browns. You can also see the egg and mushrooms. This truly is a delicious, low carb meal. I can’t wait to share this with Dad who’s doing the carb free/low carb thing. If you’re following that foodie trend, then this will be right up your alley! I just thought it was something different to try and create with squash. I’m all about the different and “outside the box” type recipes. But, like I said, I’m also on the look out for low carb recipes for Dad to try. I’ve sent him several “sharing” emails from my Bloglovin. He’s a foodie, too. Where did you think I got half of my skills from? The other half are from Mom. Dad’s the cook and Mom’s the baker; for the most part. She’ll argue she’s both and I agree. It’s not like she’s a bad cook, but she relies on recipes a lot. Dad just throws stuff together. Mom’s the baker. Why do you think she was more than happy to send me to a class for macaron? ?I hope this at least inspires you to make something unique and different. Please do scroll down and see what the rest of the #SundaySupper crew are making this week for dinner. 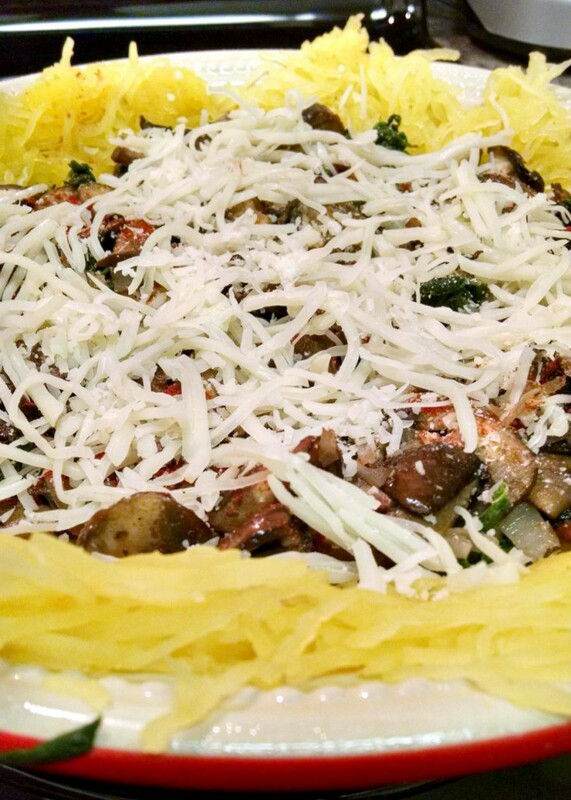 Using spaghetti squash as the crust makes a delicious and low-carb meal. The texture and flavor of the squash enhances the spinach and mushroom flavors in this Spinach and Mushroom Quiche with Spaghetti Squash Crust. Cut the spaghetti squash in half and remove the seeds. Wrap in plastic wrap and microwave on high 3 to 6 minutes or until the squash is just barely fork tender. Set aside to cool. Preheat a large skillet coated with cooking spray over medium heat. Add the shallots and saute, stirring occasionally, until they begin to caramelize; about 5 to 10 minutes. Add the mushrooms to the shallots and saute an additional 7 to 10 minutes or until the mushrooms have released their juices and begin to brown slightly. Remove from heat. Once the squash is cool enough to handle, use a fork to remove 2 1/2 to 3 cups of the flesh. Press the squash into the bottom of a 10 to 12 inch pie plate. Season with 1/2 teaspoon of garlic salt and 1/4 teaspoon black pepper. Spread the spinach on top of the squash then top with the cheese and the mushroom mixture. Sprinkle the onion powder, paprika, remaining garlic salt and black pepper on top of the vegetables. Combine the egg substitute with the half and half. Slowly pour the egg mixture over the vegetables and gently shake the pie plate back and forth to allow the egg mixture to settle. Bake at 350 for 45 to 60 minutes or until the eggs are set. Remove from heat and allow to rest 5 to 10 minutes before slicing into six servings and serve with garlic bread. My mom and dad are both low carbing it and use spaghetti squash in place of pasta. I love the idea of making a crust with it–especially since the quiche filling runs into it and cooks together. 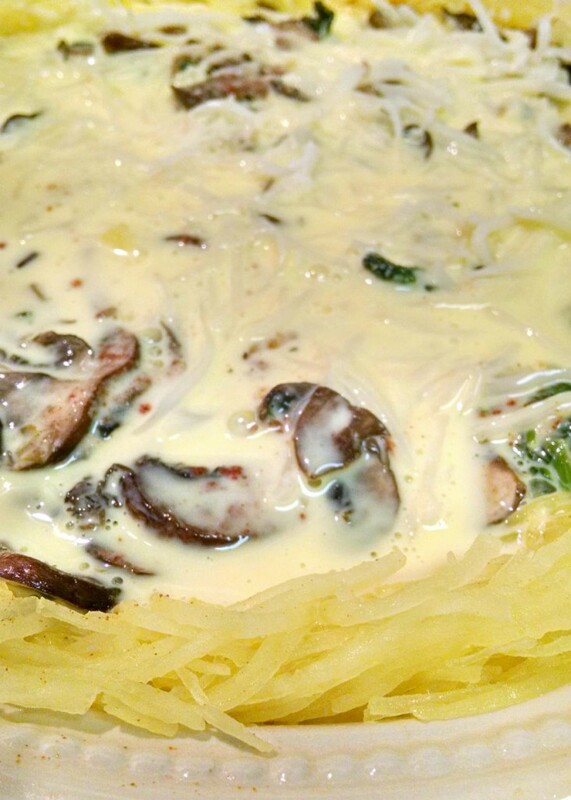 Such a cool use for spaghetti squash, Christie! You are always so creative. This is very interesting. I've never used spaghetti squash like this before but it is now on my to do list. Thank you for sharing with the Clever Chicks Blog Hop! I hope you’ll join us again next week! I'll be making this soon! Thanks for sharing the recipe. WOW! Never thought to make crust with squash! 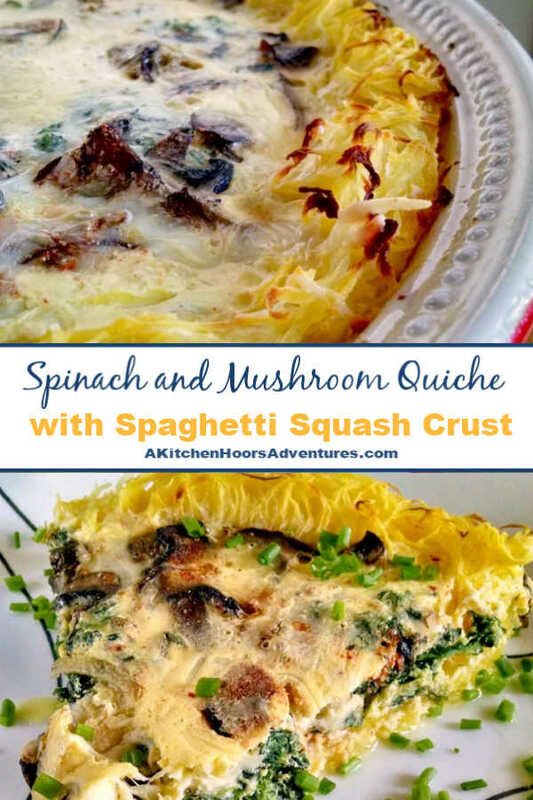 I love creating "alternative" crusts for quiche like this one – I've never tried using spaghetti squash before; I have to put it on my list! Another great idea. It sounds fantastic. 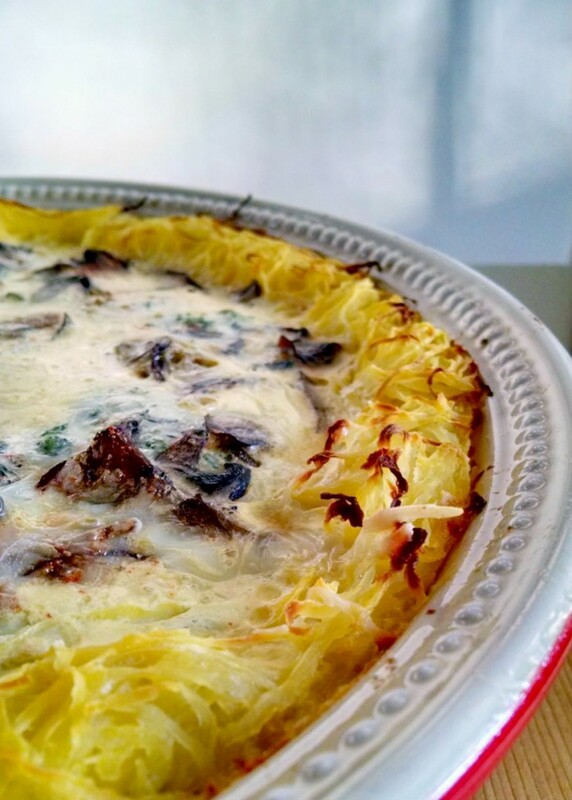 I just love this idea of a spaghetti squash crust!!! Genius!!! I LOVE finding fun, new crust ideas! This is brilliant! Thanks, Gwen. It is tasty and definitely different! Such a cool idea, never seen anything like this. I am drooling!! Thanks, Tara! I thought it was different, too. Thanks, Shaina! It turned out pretty darn tasty! I'll be linking it up tomorrow for the #meatfree link up all month. Super idea to use this squash for a crust – will definitely have to try this! It looks and sounds wonderful! Thanks, Christy! Yours looks divine! I will have to whip up a recipe for the hubs and I.
YUM! I've made pasta crusts, so why not spaghetti squash crusts? It's a delicious option! And a wonderful quiche!!! I was actually going to make a baked spaghetti squash like you make baked spaghetti, but stumbled onto this on Pinterest and knew that's what I wanted to make. Yours looks divine! I've already pinned it. Your quiche looks just amazing! Love everything about it! There's just so much I like about this from the bottom to the top and back again. Totally on my to-make list. Thank you, Renee! Please let me know how you like if you make it.